Screen capture of a YouTube video by Hearthstone Tournaments. Can a crab become a hero? In both Hearthstone and in the animal kingdom at large, the answer has long been a resounding “no.” But now the answer is: maybe. Crabs are small creatures with pincers unsuited for serious combat, whose prime virtues include a hard shell and innards that taste good when cooked and dipped in melted butter. To our feeble human eyes, crabs are capable of only a few things, like carrying knives, eating cherries, or smoking cigarettes. But in the world of Hearthstone, a crab can become a hero, and now, a full three years after its release, the game is finally starting to own up to that responsibility. Let me tell you, dear reader, about the Hearthstone card called “Hungry Crab.” It might not get as much attention as Ragnaros or Dr. Boom or that Rogue Quest card, but Hungry Crab is quite likely the finest Hearthstone card ever conceived, and it’s been around since the game first launched. Hungry Crab is special because it’s so unassuming. Unlike other beasts in the game, it doesn’t come with some fancy made-up modifier like “Stonetusk Boar” or “Infested Wolf,” and that makes it more relatable. Like you could have a beer with it. But Hungry Crab is, in certain contexts, an amazing card, and not because of its electric blue card art or even its “epic” rarity designation. No, Hungry Crab’s real defining feature is its battlecry, which allows it to eat a Murloc and grow from a 1 / 2 minion to a 3 / 4 minion. This is not something you usually see in Hearthstone. One of the most powerful Shaman cards from back in the day, Totem Golem, was a 2-mana 3 / 4 that you had to pay another mana for on the next turn. Not only does Hungry Crab do that for 1 mana, but it also destroys an enemy card, which is remarkable value for such a humble little dude. Hungry Crab’s main problem has always been malnutrition: since Murloc decks have historically been too weak to appear often in competitive play, Hungry Crab has long been considered useless. Can’t eat a Murloc if there ain’t no Murlocs around. 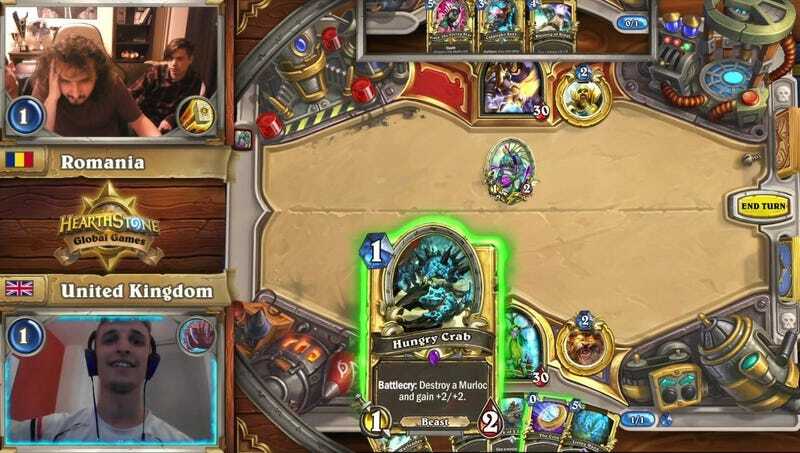 Elsewhere, Hearthstone’s game director Ben Brode Tweeted that he made it to the game’s top “Legend” ranks on the back of Hungry Crab. And pro Hearthstone player Cong “Strifecro” Shu praised the glorious crab on his own Twitter for feeling so damn satisfying to play. With so many cards coming out and changing the fundamental nature of competitive Hearthstone, it’s easy to forget about the little guys like Hungry Crab. But if there’s anything that the Journey to Un’Goro expansion has taught us, it’s that no creature is too small or worthless to do great things. Except possibly Angry Chicken.